Power Supply Operations – Up to 20 hours on 4 “AA” alkaline batteries or optional U.L. listed AC power supply. Memory – Internal rechargeable nickel-cadmium batteries will maintain memory intact for up to 30 days with power off (depending on the amount of RAM installed) and are automatically recharged from “AA” batteries or AC power. So small it’ll fit in your in-basket! The Model 100 is a true portable since it runs on batteries or optional AC adapter. And with its five built-in programs, Model 100 is truly revolutionary. Produce correction-free memos, letter sand reports with the personal word processing program, TEXT. Editing functions include finding, duplicating, deleting and moving text. With optional printer, you can print any of your files in selectable widths (up to 132 columns) without splitting words. SCHEDL turns the Model 100 into a mini-database for appointments, expenses, and “to-do’s”. And file away names, addresses and phone numbers with ADDRSS. With its TELCOM program and built-in auto-dial modem, Model 100 can be used as a terminal for computer-to-computer communications or to access information services like Dow Jones News/Retrieval or CompuServe. There’s even a program to automatically dial your phone! Programmers will love Model 100’s Microsoft BASIC – an enhanced version of our popular Model III BASIC. You get full string handling, complete file operations, multidimension arrays, 14-digit double prevision math operations and more. Separate internal nickel-cadmium batteries retain memory data with power off. Connect your Model 100 to any Radio Shack dot matrix, daisy wheel or graphic printer via the parallel interface. With the RS-232C interface, Model 100 can be connected to another computer – micro, mini or mainframe. The cassette interface lets you save or load programs, data and text at a fast 1500 baud using an optional recorder. You can even interchange text tapes withour new TRS-80 Model 4. Requires four “AA” batteries. This portable computer provides a convenient workstation for exeutives, managers, researchers, students – anyone who wants immediate computing power wherever they go. Model 100’s compact size, five built-in programs and expansion options give it the versatility to be used at your desk, in the field or on the road. And with the built-in BASIC, you can write programs for your other applications. We’ve redesigned our best-selling portable – the famous Model 100 – into an even smaller package. But we’ve retained the same remarkable features, including five instant-on programs, an 8 x 40 display and a modem – all built in. Use the Tandy 102 as a personal word processor, address/phone directory, appointment calendar and telephone auto-dialer. Access other computers or national infomration services by phone with the built-in modem and communications program. You can even write your own programs in BASIC. Includes parallel, RS-232C, cassette and bar code reader interfaces. Only 3 lbs. Requires four “AA” batteries. Only 3 pounds and 1/2″ high! Use the Tandy 102 as a personal word processor, address/phone directory, appointment calendar and telephone auto-dialer. Access other computers or national information services by phone with the built-in modem and communications program. You can even write your own programs in BASIC. Includes parallel, RS-232C, cassette and bar code reader interfaces. Requires four “AA” batteries. Our lightest portable computer is now even better with 32K of RAM for more dynamic computing power. 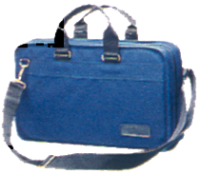 It only weighs 3 pounds and is 1-1/2 inches high – first easily in a briefcase. Five instant-on built-in programs let you use the Tandy 102 as a personal word processor, address/phone directory, appointment calendar and telephone auto-dialer. Access other computers or national informaiton services by phone with the built-in modem and communications program. And you can write your own programs in BASIC. The Tandy 102’s compact size, built-in programs and expansion options give it the versatility to be used at your desk, in the field or on the road. 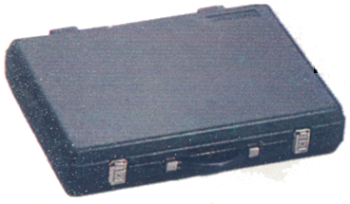 Includes paralell, RS-232C, cassette and bar code reader inferfaces. Requires four “AA” batteries. 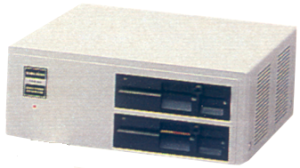 Disk/Video Interface 26-3806 $799.00 Turn your Model 100 into a versatile disk-based home or office system! Built-in disk drive lets you create, store and retrieve files on diskette. It’s much faster and more reliable than cassette storage. Provides a 40-character by 25-line screen display on any television, and an 80 x 25 display when hooked to a standard video monitor. The larger screen is perfect for word processing or developing programs in BASIC. Just plug the Disk/Video Interface into an AC outlet, connect a TV or monitor and a Model 100 – all cables included. There’s no new operating system to learn and one simple command switches the display to the video screen. The Interface does not require use of Model 100’s standard connectors – so you have room for further expansion. You can add a printer, bar code reader, RS-232C communications device or cassette recorder. Requires Model 100 with 16K memory. Tandy 200/Model 100 Portable Disk Drive 26-3808 $199.95 Get fast access to 100K of data on 3-1/2″ floppies. Features menu-driven operation, list of files on disk, plus FORMAT, SAVE, LOAD, KILL and RENAME functions. Transfers data at 19,200 baud. Battery warning lamp. disk access lamp. When the batteries are low, and the unit is in process of saving, loading or backing up, it will finish its job befwe shutting down. Unit will not function if batteries are low, but will finish the job. Initialization software included. Weighs 1-3/4 lbs. 2 x 4-15/16 x 6-1/8″. Requires four “AA” batteries or AC Adapter (not included). Portable Disk Drive 2 26-3814 $199.95 200K of data on 3-1/2″ floppies. Requires four “AA” batteries or AC Adapter (not included). Model 100 Bar Code Reader 26-1183 $99.95 This optical scanning device is expressly for the Model 100 and is ideal for such tasks as billing, couponing and retail-item control. 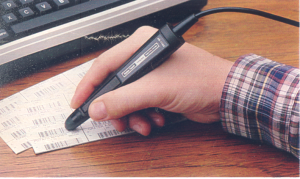 The pen-like wand simply plugs into Model 100’s standard bar code reader interface. Software drivers callable from BASIC allow the Model 100 to read the Universal Product Code, 3 of 9, or NATI bar code formats. Bar code wand contains “soft-touch” push-button switch to conserve power when not in use. TRP-100 26-1275 $299.95 Rugged and incredibly quiet (50 decibels) – perfect for use with Model 100. Use it anywhere – works on batteries or AC power! Weighs less than 5-1/2 lbs. 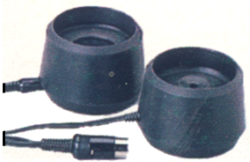 2-3/4 x 11-7/8 x 7″. U.L. listed AC operation or five “C” batteries (not included). 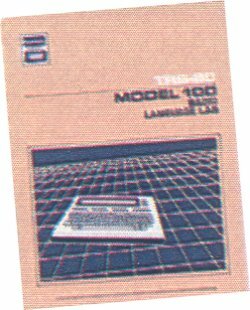 The TRS-80 Model 100 Portable Computer 26‑3819 14.95 A complete step-by-step learner’s manual. Discusses the capabilities of the Model 100, plus a complete course in Model 100 BASIC. BASIC Language Lab 26-3821 $29.95 This comprehensive guide helps you learn Model 100’s powerful Microsoft BASIC in an easy to use tutorial style. In addition to teaching BASIC commands and the process of writing programs, the BASIC Language Lab covers other related areas such as redefiniting function keys F1-F8, automatic execution of BASIC programs, and using Model 100’s graphic and sound capabilities. BASIC Language Lab provides complete examples of each new concept presented. Includes a cassette tape with three sample programs for further illustration. Calculator 26-3827 $19.95 Turn your Model 100 into an arithmetic “scratchpad”. The basic program performs addition, subtraction, multiplication, division, exponentiation and sfweral extended math functions. A special business program does extended calculations formulated to solve business-related problems. Data Manager (Cassette) 26-3836 $39.95 Personal filing system for the TRS-80 Model 100 Portable Computer. Lets you store, examine, update and list a variety of information – from personal records to appointment schedules. SCRIPSIT 100 26-3830 $39.95 Turns Model 100 into a true word processor-with far more powerful and sophisticated features than Model 100’s built-in word processing software. Features advanced formatting capabilities. Produce correction-free letters, memos and reports with page headings, numbers, headers and footers and much more. Requires printer. Multiplan 26-3829 $149.95 An electronic worksheet that’s ROM-based-does not occupy Model 100 RAM! This portable version of, the popular spreadsheet analysis program provides a large grid for entries which can be made up of words, numbers or formulas. Alter a value or formula and watch the figures change as Multiplan automatically up dates all affected numbers. Interactive Solutions 26-3844 $149.94 Contains three programs: Data Manager, Spreadsheet and Text Formatter. Information stored in Data Manager can be utilized by Spreadsheet and Text. Data Manager can have up to 20 fields per record. Spreadsheet can be a maximum of 99 rows and 99 columns. Text gives you several printing parameters for better document control. Plugs into ROM socket – programs are not stored in RAM. The .CO file extension in a Model 100, 102, 200 means that the file is programmed in machine language. Just because you “see” the .CO file in your menu does not mean it is where it has to be to run. In fact, it’s easy to know if a .CO is installed as it will beep and return you to the menu if it is not. It’s that simple! Machine language programs can not run in a Model 100, 102, 200 without being “copied” to a special place in RAM. And yes, once copied to that special place in RAM the .CO files also reside in yet, another place in RAM so they will appear in your menu, i.e. a installed .CO file that is also seen in the menu is in RAM in two places. This is not necessarly bad – just the way it works in these machines. Note: In this example the word “filename” refers to the name of the .CO file, and ##### refers to the “Top:” number you need to find and use to install the .CO file. an error code – ignore the error. Write down the “Top:” number. more than one .CO via stacking, and .CO file swapping. WARNING! This patch has been tested on one and only one Model 100, i.e. the one on my desk. It has 32k of RAM. This has not been tested on machines having less RAM, nor has it been tested on the Model 102 or 200. I’ve noticed side effects on my machine when running machine-language programs. Usually these side effects resulted in locking the machine up or cold restarts causing memory loss. Make a backup! I haven’t tested for effects on the built in apps as yet. 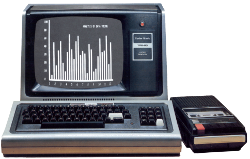 The TRS-80 Model 100 was created in a joint venture between Kyocera (for the hardware) and Microsoft (for the software). The Model 100 has an attractive main menu display, which displays the date in the form “Jun 20,1998 Sat 13:15:36”. The Model 100’s real-time clock chip is a uPD 1990AC which stores a BCD represntation of month, day of week, day of month, hours, minutes and seconds. It also produces a pulse that drives a background process interrupt. Conspicuously absent is the year. The Model 100 works around this by storing the 2-digit year as 2 BCD digits in locations F92Dh and F92Eh and updating these by comparing the month reported by the 1990AC with a copy stored in addr F655h. The day-of-week is maintained in a separate register in the 1990AC, and not calculated. If you decide today is Sunday, the chip will happily believe you and tell you tomorrow is Monday, regardless of the actual day and date. This makes our task considerably easier. The 5A15h routine uses a scratch pad starting at FD88h to build the output string, and the “19” gets dropped into the two bytes FD8Fh and FD90h. If one had a way of changing these values before the instruction that copies them to the LCD display is called, surely we’d be in Nirvana. But the LCD update is called just a few instructions later. 6 ‘ before questionable activity! 81 ‘ have JMP 0F5E0H encoded here. 120 POKE 62975,195 ‘ and JMP! The code pushes registers that may be affected, then goes to store the “20” in the right place. It’s certainly overkill to do this 256 times per second, and will likely have a performance impact. Unfortunately, there’s no hook provided in the date string builder routine. The POKE at line 1010 restores the original RET instruction, disabling the patch. The program uses the uppermost 16 bytes of free user memory (starting at MAXRAM – 16) to store the patch. Any machine language program that will use that area will need to have the patch disabled by restoring the RET instruction to F5FFh. I haven’t determined whether the scratch pad at FD88h is used by any builtin programs. Obviously, the menu doesn’t need it during at those times, and it appears that it isn’t updated. A way of determining when one is in the menu program is desirable. 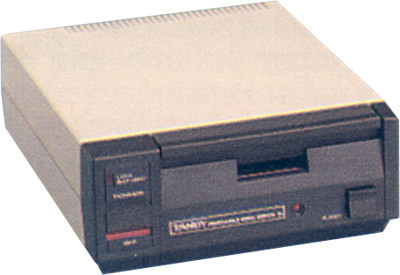 Among other things made available for the Model 100, Tandy sold device called the Disk Video Interface. The DVI consisted of a box (approx 12″ w x 6″ h x 16″ d), a monochrome monitor, a cable, a boot disk, and a manual. One would plug the cable into their Model 100, follow the booting instructions in the manual, and be able to view their Model 100 activities at either 40 column or 80 column on the video monitor.